PHONE CALLS: Call and ask to stop the killing of Yellowstone buffalo. Please email Governor Bullock HERE and ask him to stop the Yellowstone bison slaughter. If you have a connection to Montana, please mention it. Write in your own words or copy and paste the statement below. Please stop the killing of America's national mammal in Yellowstone. There are have not been any cases of brucellosis transmitted to cattle and the annual slaughter of these animals takes one million pounds of food out of the ecosystem. Grizzly bears increasingly rely on bison as climate change has decimated other key food sources. When bison are removed from the food chain, these bears turn to livestock. 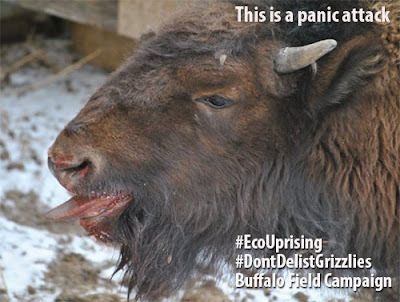 Instead of sending Yellowstone's buffalo to slaughter, please hold animals that leave the park be kept in holding until green-up in 6-8 weeks. This is the right thing to do. Please email Superintendent Dan Wenk HERE and ask him to release bison captured and stop future plans to slaughter our national mammal. FACEBOOK COMMENTS: Write your own comment on Governor Bullock's Facebook page asking him to stop the bison kill in Yellowstone or copy and paste the one under EMAILS. Then comment on Yellowstone National Park's page and ask them to release all bison and stop plans for future capture. Please include one of our graphics on Yellowstone's page. MAKE A DONATION: Buffalo Field Campaign is in the middle of all of this carnage. They are a shoestring operation and would greatly appreciate - and utilize - any donations given. 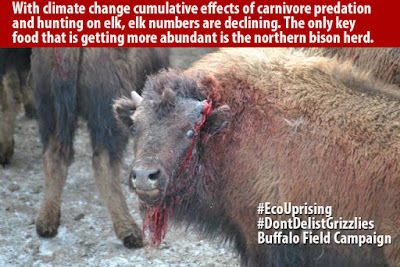 MORE STEPS TO TAKE: Buffalo Field Campaign has other actions that you can take HERE. CALL TO ACTION: Stop Senate Joint Res 18!